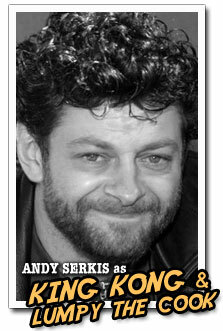 Mini biography: Andy Serkis always wanted a future in entertainment. Growing up in Ruslip Manor, England, he visualized himself working behind the scenes in production. Today, he is an impressive British character actor with over 50 stage, television, and film credits, distinguished performances on both Masterpiece Theatre and Mystery!, and a highly coveted role in Peter Jackson's three-part adaptation of J.R.R. Tolkien's The Lord of the Rings trilogy. Serkis began his acting career in theater. He has appeared on almost every renowned British stage -- the Royal Court, the Royal Exchange Manchester, the West Yorkshire Playhouse, Hull Truck, Dukes Lancaster, the Nuffield Studio, and Donmar Warehouse -- and in a host of popular plays.